V.M Trucking LLC. Maintains a state-of-the-art U.S. Customs bonded Container Yard (CY) (FIRMS CODE #F449) Facility located minutes from the Ports of New Jersey and New York. Our Yard is centrally located near all major Highways. With 24hr manned security and a full video and electronic perimeter security systems our customers can feel safe in knowing their equipment and freight is fully secured. design aimed at minimizing the total time our customer’s trucks spend in our facilities. We have streamlined our gate operations to provide efficient turn times and hassle free transactions for container carriers. Our gate consistently maintains turn times less then 30 minutes per transaction. Our trained inspectors check each piece of equipment for damages according to customer specifications. Dispatch clerks have full access to our system containing customer-specific information to help expedite transactions. Steamship Lines in South Jersey, Philadelphia and other states with customers in the New York and New Jersey area can reduce storage expenses for containers while providing customers and drayage carriers with a convenient interchange location and container availability in the Port Newark area. V.M Trucking can help avoid high demurrage and per-diem charges whenever storage or deliverability is an issue. We can ensure container availability for your high-volume shippers or consignees and provide better customer service while reducing costs by taking advantage of our container depot services. V.M Trucking provides equipment interchange report inspections and arrival notification procedures that can be customized to your specifications. 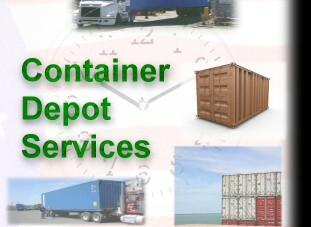 Call V.M Trucking today to discuss your container storage, and distribution needs and discover what we can do for you.